The company’s entry into this polarizing yet popular theme for toys and games allows children ages 3 and up to drop and decorate squishy, emoji-like poop swirls using the venerable modeling compound. In addition to a poo mold and various decorating tools, the set comes complete with a variety of plug-in “silly face parts,” including ears, eyes, noses, arms, mouths, and a hat. The parts can be mixed and matched into over 50 different poopy creations. Hasbro has packed 12 cans of various colours of Play-Doh into the set – 10 standard-sized 2-ounce cans, and two small 1-ounce cans. Four of them are brown. 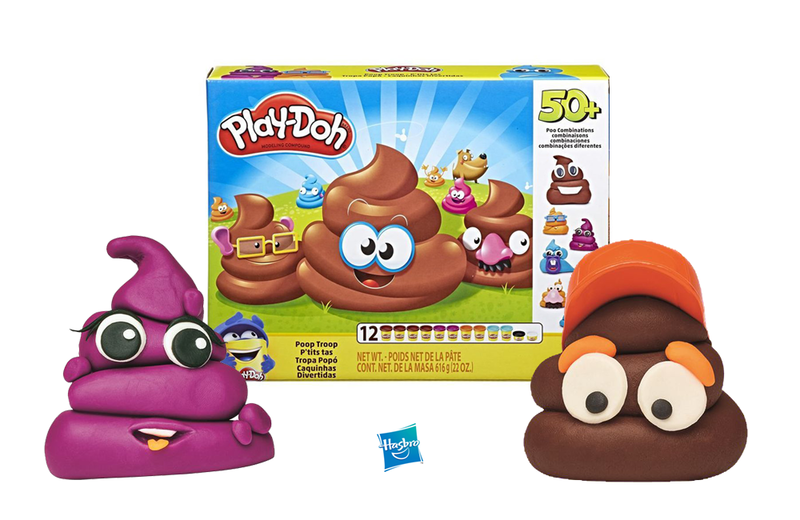 The Play-Doh Poop Troop set checks in at $14.99USD and is available directly from the Hasbro store and various retailers. Playmates Toys pays homage to the 1984 sci-fi cartoon series, Voltron: Defender of the Universe with the release of the Voltron Classic '84 Lion Collection.